The total re-invention of our box-room as a playroom is coming on well. OK, it's coming on slowly. I get approximately 1 hour a week to spend on painting the walls so it is some weeks away from being ready to reveal to you but I've been collecting ideas and inspiration on a Pinterest board I can share and I've discovered a few fantastic items that I just HAD to have in the new room. The Nuby green paper lampshade was bought within seconds of me seeing the photo on Pinterest! And this clock from Red Candy, likewise! Red Candy is a website full of shiny red things for the home; they asked me to take a look through their products to see what took my fancy and despite being wildly tempted by some bright red toilet paper, I couldn't help but be drawn to their collection of clocks as I really wanted a clock on the wall of the play room to help the girls learn to tell the time and to provide a centre-piece for the wall. All of their clocks were awesome. In fact, across the entire website, there aren't many things I don't want! Red Candy isn't just about red things. OK, there are a lot of red things... housewares for the kitchen, living room and dining room... but there are all sorts of other non-red things too! I had just purchased some wall stickers for the playroom but I tell you what, the range of childrens wall sticker AND grown-up wall stickers on Red Candy is pretty damn awesome. I could quite happily decorate about 10 different styles of playroom from their range. 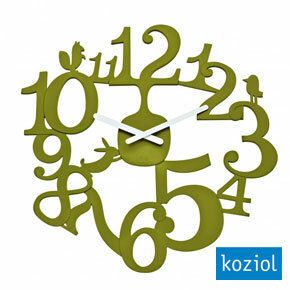 Anyway... the olive green P:ip wall clock from Koziol was the perfect thing to come and live in the new playroom. The natural green colour will work well with the nature and wildlife theme that I'm planning and the tiny animal shapes are very cute and will co-ordinate well. I love this clock, not only because it is huuuuuge (but not heavy because it is plastic) but because it is quirky. The clock isn't traditional in any sense but because the numbers are clearly legible, I can use it to help teach Lara to tell the time. The P:ip clock takes AA batteries and has a simple wall fastening that requires a wall hook. For me, it is perfect. You can follow Red Candy on facebook and twitter. Note: RedCandy contributed to the cost of the clock for the purposes of my review but I would happily have paid full price!